The ACE Biblio builds on a well known design from our GiantMouse line, namely the GM1. This is a stout little cutter with great capabilities. An all around EDC folder that looks good and performs even better, no matter if you are out in the woods or in the city. A knife for both “Dives and Dance Halls” so to speak. The handle fills even larger hands well, due to the nicely rounded scales and good ergonomics. Speaking of the handle, we chose to blast the black G10 and green canvas Micarta for grippyness and great feel. When using the Biblio you’ll notice how well it performs. Again, the ergonomics are spot on, but also the nicely thin ground blade makes this a real slicer. By choosing the flat saber grind on this knife, we got a strong blade with a fine cutting edge that you’ll enjoy using. To get you an even better blade we went with Böhler M390 on this one. 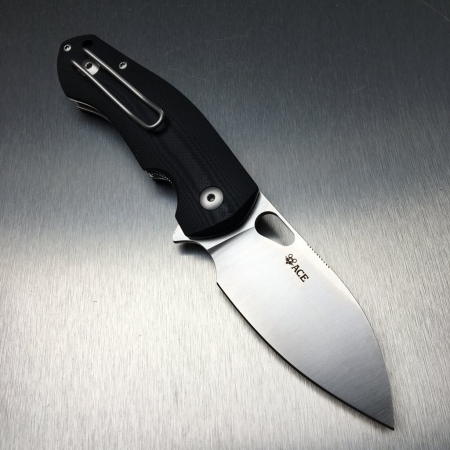 Blade Steel: Böhler M390 MICROCLEAN stainless steel. Satin finish. Handle: Black G10 - Bead Blasted. Liner: AISI 420 Hardened - Bead Blasted.